The precautionary principle originated in the 1970's, according to some reports, with the environmental movement in Germany. In 1982 the World Charter for Nature, which was adopted by the UN General Assembly in 1982, was the first international endorsement of the precautionary principle. By the late 1980's the principle was being incorporated into European environmental statements. It was subsequently incorporated into a number of international conventions, but the most widely cited is the 1992 Rio Declaration on Environment and Development. While originally popularised in an environmental context, it has subsequently been embraced, in the wake of the mad cow outbreak in the late 1990's, to foods and other public policy areas. In 1987 the Ministerial Declaration of the Second International Conference on the Protection of the North Sea (1987) states that "in order to protect the North Sea from possibly damaging effects of the most dangerous substances, a precautionary approach is necessary which may require action to control inputs of such substances even before a causal link has been established by absolutely clear scientific evidence". In 1990 the statement was refined at the Third International Conference on the Protection of the North Sea defined the precautionary principle as being "to take action to avoid potentially damaging impacts of substances that are persistent, toxic and liable to bioaccumulate even where there is no scientific evidence to prove a causal link between emissions and effects". In addition to the Rio Declaration, in 1992 both the United Nations' Framework Convention on Climate Change and the Convention of Biological Diversity referred to the precautionary principle. Both conventions, in slightly different ways, stated that the lack of "full scientific certainty should not be used as a reason for postponing" measures to prevent climate change or biological loss. The Maastricht Treaty of 1992 and the later EC Treaty noted that European Union environmental policy would be "based on the precautionary principle and on the principles that preventive action should be taken, that environmental damage should as a priority be rectified at source and that the polluter should pay". On April 13, 1999 the Council of the European Union adopted a resolution urging the Commission give greater emphasis to the precautionary principle "in preparing proposals for legislation and in its other consumer related activities and develop as priority clear and effective guidelines for the application of this principle". At the Rio Earth Summit in 1992, precaution was enshrined as Principle 15 in the Rio Declaration on Environment and Development: "In order to protect the environment, the precautionary approach shall be widely applied by states according to their capabilities. Where there are threats of serious or irreversible damage, lack of full scientific certainty shall not be used as a reason for postponing cost-effective measures to prevent environmental degradation." The Precautionary Principle was the basis for arguments in a 1995 International Court of Justice case on French nuclear testing. Judges cited the "consensus flowing from Rio" and the fact that the Precautionary Principle was "gaining increasing support as part of the international law of the environment." At the World Trade Organization in the mid-1990s, the European Union invoked the Precautionary Principle in a case involving a ban on imports of hormone-fed beef. Here is a short video which explains the concept very well. The logic is reversed from the chart above. It depends if the "action taken" which has the big payoff with a small chance of extreme catastrophe, or the "action not taken". The Principle is identical in both cases. Indur M. Goklany, The Precautionary Principle: A Critical Appraisal of Environmental Risk Assessment, Cato Institute, September, 2001) ISBN: 1930865163. United Nations Environment Programme, "Rio Declaration on Environment and Development", June 1992. Commission of the European Communities, "Commission adopts Communication on Precautionary Principle", Media Release, February 2 2000. Commission of the European Communities, "Communication from the Commission on the precautionary principle", February 2, 2000. 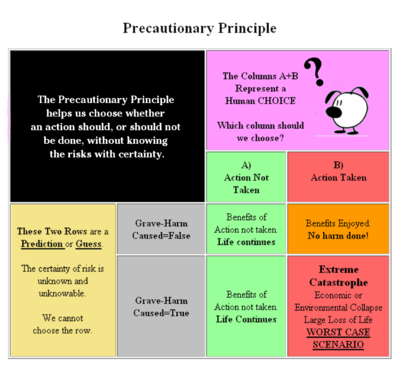 "Precautionary Principle." This page is sponsored by Ag BioTech InfoNet. Jeff Smith, "The Precautionary Principle and the Public Interest", Environmental Defender's Office (NSW), undated. (This is a guide prepared for those with an interest in environmental law in the Australian state of New South Wales). David Appell, "The New Uncertainty Principle", Scientific American, January 2001. Nancy Myers, "The Rise of the Precautionary Principle: A Social Movement Gathers Strength", Multinational Monitor, September 2004. The cover image says it all. "Answering Critiques of Precaution, Part 1", Rachel's News, Volume no 789, April 15, 2004. Julian Morris, "Defining the precautionary principle", Science, Technology and Innovation, 2000 (approx). Wirthlin Worldwide, The Precautionary Principle: throwing the science out with the bathwater, February 2000. (This report is subtitled "a special report prepared in co-operation with Nichols-Dezenhall"). Helene Guldberg, "Challenging the precautionary principle: How has society come to be governed by the maxim 'better safe than sorry'? ", Spiked Online, July 1, 2003. Lee C. Gerhard and Victor John Yannacone Jr., "Invoking a Real Precautionary Principle", Tech Central Station, February 17, 2004. Marla Cone, "Europe's Rules Forcing U.S. Firms to Clean Up," Los Angeles Times, May 16, 2005. David Michaels, "The Art of 'Manufacturing Uncertainty'", Commentary, Los Angeles Times, June 24, 2005. This page was last edited on 3 December 2012, at 20:18.